"Good things come in small packages". We've all heard that saying, and there's a recent XGA projector offering from ViewSonic that confirms the adage. The PJD6221 is a 5.8 lb. portable projector with a bright 2,700 lumen rating that is appropriate for classrooms and conference rooms alike. Educators get a real break on price . 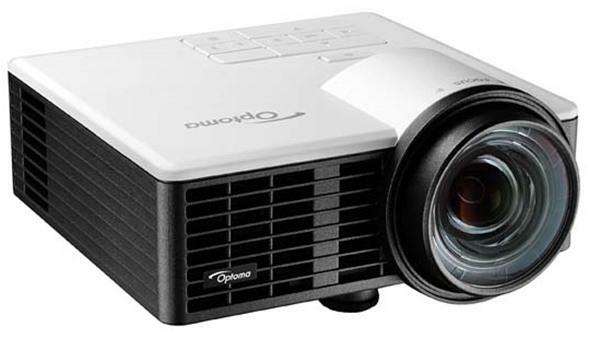 . . they can buy this DLP-based projector for just a shade over $600, but even the list price of $999 is not unreasonable for this class of product. Nothing is perfect and there are a couple of limitations you need to be aware of, but all in all, ViewSonic's PJD6221 is a lot of projector for a modest cost. Brightness: Connected to a computer in its Daylight mode with the White Intensity control set to its maximum, the PJD6221 puts out 2,420 ANSI lumens, a bit shy of its published spec of 2,700 lumens. Changing to other operating modes produces different levels of brightness depending on the source. With a 100 IRE data source, PC mode checks in with 2,420 lumens and sRGB with 1,070. With a video source, Movie mode brightness is a healthy 1,295 lumens. This is usually a little bright for best movie viewing, but lowering the White Intensity setting will reduce brightness and may make the images more pleasing to your eye. Switching the lamp to Eco mode reduces the image brightness by only 14%, and for that small sacrifice, lamp life is extended from 3,500 to 5,000 hours. If your presentation environment permits, this mode is a good choice for reducing power consumption and fan noise, too. Uniformity: It's not unusual for low-cost projectors to exhibit brightness uniformity in the 60-70% range, but the PJD6221 delivers a noteworthy 78% figure. The result is that you won't notice any brighter or darker portions in images on your screen, even with the largely white content of text documents and spreadsheets. Image Sharpness: The first thing that jumps out at you when you set up the PJD6221 is its excellent sharpness from edge to edge. At optimum focus in the center of the screen, fine lines and small type are very clear in the corners of the image. The zoom lens meets its 1.2x specification, and ANSI brightness reduction is minimal at the full telephoto setting, as is typical for short zoom lenses. Menu: The on-screen menu is easy to navigate, and in addition to the usual complement of controls and adjustments, the menu offers some fine tuning for color saturation, hue, and gain in the User menu. Automatic scaling for 1080i video and SXGA is smooth, and the image aspect ratio can be set to 4:3 or 16:9. The PJD6221 offers a BrilliantColor setting and is also 3-D ready with support for up to 120Hz frame rates. Connections: Like most projectors designed for the classroom market, the PJD6221 has no digital input, but it does accept computer data and component video via either of its two VGA input connectors. It also has S-video and composite video inputs. Mini jacks handle audio input and output, and remote sensing (RS-232) and Internet (RJ-45) connections are provided along with a VGA output for monitor loop-through. There is also a Kensington lock and an additional security bar to thwart thieves. However, it may be wise to keep an eye on the credit card-size remote control because it is small enough to get lost or carried off in someone's pocket. Preset modes: ViewSonic provides eight preset modes for the PJD6221, and they are divided into two groups: one for content and room lighting conditions (PC, Movie, sRGB, User, and Daylight) and the other for non-standard projection surface colors (White Board, Black Board, and Green Board). Several modes have a slight tint, but none are particularly distracting. Image quality: PC images such as spreadsheet data look clean and crisp, and, while not home theater quality, embedded video in a PowerPoint presentation is neither flat nor muddy. Photographs look sharp and natural with saturated and well-balanced colors. Keystone correction up to 40° has little effect on the readability of even 8-pt. type. Video images in Movie mode tend to be slightly red, and the dynamic range is somewhat limited. In scenes with bright clouds and deep shadows, some detail in both areas is lost. The lower brightness of Cinema mode may also require some room darkening to keep the image from washing out a bit, but if ambient light control is difficult, switching to User mode may solve the problem. The best video images can be obtained in Movie mode by lowering the contrast and brightness settings and by reducing red level slightly in the color temperature menu. Maintenance: The PJD6221's lamp is accessible through the top of the projector, so even if it is ceiling-mounted, lamp replacement is relatively easy. ViewSonic also recommends vacuuming the air intake area on the left side of the projector every 100 hours of operation to keep any accumulated dust from blocking airflow to the interior of the projector. Very thorough review. I found it very helpful and yet technical enough for me. Mr Abbott writes very well. I need to replace my 32 year old Advent Videobeam 760! I have its 6ft (4x3) screen. Most of my pre-recorded material (LD and DVD) is 4x3: classic movies and TV shows. So, I am leaning towards an XGA or SVGA projector. The PJD6221 looks interesting. I view in a mostly dark room. Is this the one for me? Thanks for the review and any additional comments (regarding non data use) would be very welcome. I have a question. I want to connect this projector to a 3D blu-ray player that has HDMI What would be the best way to get 3D effect ? Since this Viewsonic doesn't have HDMI connection, what would you suggest ? Including cables, 3D glasses (I have Nvidia glasses with emitter). Thank You for your time.